The Forestman is one of sixteen minifigures from 8683 Minifigures Series 1. He comes with a quiver and a cap, and bears some resemblance to the old Forestmen, but with greater details. The Forestman has green legs and hips. He has a green torso with printing of a brown belt with four light-coloured dots on the right side of it. A strap runs diagonally from his right shoulder to his left hip. Both the belt and the strap have buckles. The upper-portion of the torso is a darker green than the rest of it and has a tan collar at the top. He has tan-sleeved arms yellow hands. The forest man has a yellow head with a light brown beard, mustache, and eyebrows as well as eyes with pupils and a slightly open, grinning mouth showing white teeth. He has a green hunter's hat with a small red feather in it. The Forestman comes with two accessories: a bow and a quiver. An extra feather is included in the set. Parts of this minifigure appeared in the Build-a-Minifigure bins at the LEGO Store. 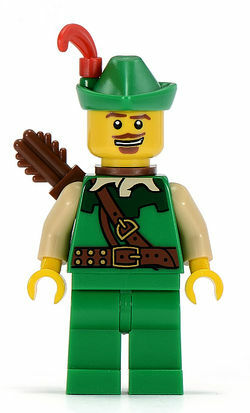 The Forestman's face is available on the LEGO Universe version of LEGO Digital Designer. In his second "Did You Know" fact, it mentions Trolls from Castle (2007). He was given a similar look to a famous story character, Robin Hood. He is featured in The LEGO Movie as a Master Builder. The brave and fearless Forestman is always arriving just in the nick of time to save the day. Whether he’s swinging down on a vine to rescue a damsel in distress, leaping boldly from the castle battlements to duel an evil duke, or making an incredible trick shot with his bow and arrow to help a friend in danger, he is at all times the very model of a chivalrous hero of legend and yore. The Forestman loves to make a good first impression and is always practicing his dramatic entrances to get them just right. He’d come to the rescue anyway, of course (it’s just in his nature to right wrongs and fight injustice wherever he finds them), but it’s terribly disappointing for him if no one is around to see him gallantly arrive on the scene for his latest feat of swashbuckling derring-do. He’s only sad for a moment, though, and then it’s off to battle the bad guys and save the day once again! Despite years of living in the woods, the Forestman still can’t tell poison ivy from regular ivy. The Forestman once rescued two princesses, saved three villages from evil trolls, and defeated an entire band of pirates in one day, before breakfast. The Forestman has a lifelong fear of crocodiles. LEGO Club Magazine Issue 1 2011 - Minifigures All Around Town! LEGO Club Magazine Issue 3 2010 - Time To Get Mini With It! This page was last edited on 11 July 2016, at 23:40.